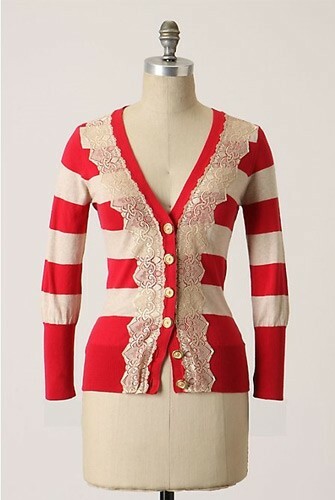 Last winter, Anthropologie had a cute cardi on their racks. With a pricetag upwards of $100, it certainly wasn't going to be making it home to my wardrobe anytime soon. I knew it would be simple enough to copy, so I always kept an eye open for striped cardis. Last week at Target, I snagged a Mossimo brand striped cardi for $15. With some lace I already had on hand I recreated the look.